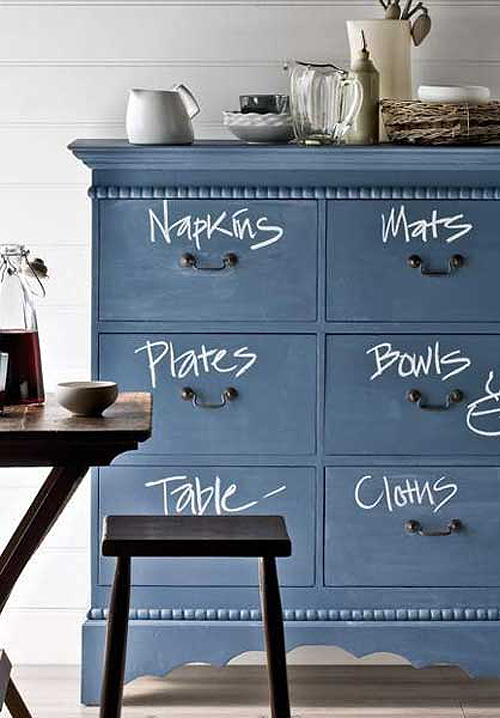 I like how this chest of drawers is transformed into a fabulous eye-catching piece for dining room or kitchen – thank to some chalkboard paint. Labelling the drawers with chalk adds a fun detail. To achieve strong, bright letters that don’t smudge easily, wipe the surface with a damp cloth just before you write, then leave to dry naturally for cute labels that make it easy to delegate setting the table. I found this idea on homelife, here you find a ‘how to apply chalkboard paint guide’. Love this idea. Would it be tacky to paint everything with chalkboard paint? I would like it! I love the labeling! Why didn’t someone think of this before?! I LOVE the look & the endless possibilities… I’ve almost convinced myself I need a chalkboard wall in my lounge room. Will it look smudgy and dirty once I’ve wiped off my scribbles?